In our last article, we identified a clear risk management objective: certainty. Risk management is really about understanding and managing uncertainty to create more certainty. They say, “what gets measured gets managed.” So, if you’re not measuring your FX risk, you might not be managing it – even if you think you are. Measuring FX risk is how you’ll know whether it’s a “wildfire,” as we deemed in the prior article, or when your FX wildfire is under control. A good model will use probability to help you understand random outcomes, like FX rates, so you can assess risk’s potential impact and likelihood. Measuring risk begins with modeling risk. Using models will help you identify what risk management activities are required to meet your company’s objectives, so you can prioritize resource allocation. A good model will use probability to help you understand random outcomes, like FX rates, so you can assess risk’s potential impact and likelihood. With probability comes the concept of volatility. Don’t panic — you don’t have to do any math, just understand how probability enables us to measure and understand risk. The goal is to eat a cheeseburger, not to butcher the meat. Remember the “bell-shaped curve?” (aka normal distribution of a random variable). Let’s say you want to model how EUR will affect your company. The normal distribution can represent returns on the EURUSD exchange rate (see graph), meaning a positive or negative return on 1 euro. For now, understand these concepts about the probability distribution used to model market risk, such as the return on EUR. The distribution of future returns on EUR has an “expected” outcome before the “actual” outcome occurs. 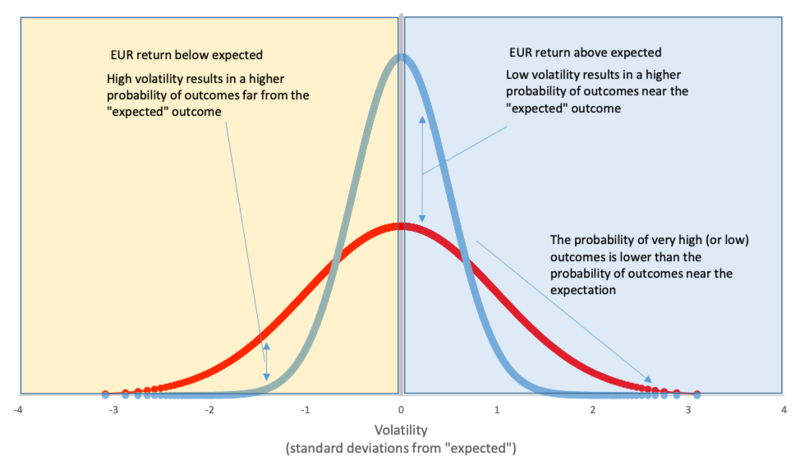 There is almost no probability the actual outcome will exactly match the expected EUR return. The distribution illustrates how uncertain (volatile) the “actual” future outcome is. A probability model allows you estimate the likelihood of bad (or good) outcomes. When market volatility is high (red distribution in the graph), the probability of outcomes near the expected value declines. Why should CFOs and treasurers care about probability? What if I told you your company’s FX exposures could result in ($1.00) loss on EPS next year? That’s a bad outcome for almost any company. But the resources the company will allocate to avoid it will depend on the likelihood of the loss. If the loss has a probability to occur once in 100 years, the company will treat it less urgently than if it’s likely to occur once in 10 years. It might seem complicated, but the message is simple: hedging FX takes a random outcome and creates certainty. Probability can be used in so many ways to understand uncertainty and help you to know when risk jeopardizes your organizational goals. It might seem complicated, but the message is simple: hedging FX takes a random outcome and creates certainty. Whether the company hedges 50% of its EUR exposure while EUR volatility remains at 10% — or the company does not hedge at all, and volatility decreases to an annual rate of 5% — the risk profile of its EURUSD conversion in 3 months is identical. In the next article, we’ll show how modeling FX risk using probability will help you understand potential impact and help you set meaningful, measurable risk management objectives to drive your strategy. We’re generalizing some financial modeling theory, which regards returns as normally distributed, and prices as lognormally distributed. That premise is typically applied to daily returns, but it is frequently extrapolated to longer return periods, when grappling with longer term risk. The 3-month EUR yield and the 3-month USD yield are used to find the 3-month forward EURUSD rate. It is the EURUSD 3-month yield differential that will result in “forward points,” included in the contract rate of a EURUSD 3-month forward contract. The “expected” EURUSD rate is the 3-month forward rate as of January 15, 2019, using a spot reference rate of 1.15. Chuck Brobst is the Managing Director of Analytics and Innovation Strategist at OANDA Corporation. He teaches graduate courses on risk management and banking at DePaul University. Previously, he founded GFM Solutions and spent 15 years in global markets divisions of BAML and ABN-AMRO Bank. Auditor? CPA? Tax professional? Access Excel-ready, historical FX rate data with OANDA’s Historical Currency Converter. Get 25 years of history and reliable, accurate data trusted by the world’s largest audit firms. Start your Free trial today.